Our self-inflating ProLite mattresses are tailor-made for anyone seeking lightweight and convenient three-season comfort. Self-inflation keeps set-up super-easy and its die-cut foam packs small, easily fitting inside the most ultralight packs. The result is a mattress that's ideal for high-mileage, high-speed journeys where lightweight, three-season warmth is key. Stuff sack included. The ProLite's tapered shape shaves off weight while maintaining comfort. ProLite mattresses are the lightest self-inflating mattresses made by Therm-a-Rest. Designed for lightweight, three-season comfort, the ProLite features die-cut foam and a tapered shape that provides warmth and comfort while minimizing bulk. Thanks to light, compressible materials, ProLite mattresses are pack friendly and ideal for high-mileage, high-speed journeys where weight and warmth are key. 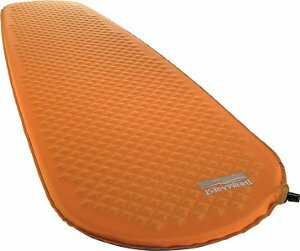 The Therm-a-Rest Fast & Light series mattresses are designed with the high-speed, low-weight performance sought by alpinists, adventure racers, and long-distance backpackers--without sacrificing comfort. The lightest self-inflating mattress Therm-a-Rest makes. Die-cut foam and tapered shape provides warmth and comfort with limited bulk. Light, compressible materials make the ProLite mattress pack friendly.